We have just seen the rise and fall of a military coup in Turkey. Many of the details have yet to become clear but one thing that is known is during the attempted coup factions of the military leading the uprising targeted Turkish police headquarters and killed 17 police. This pattern of military or insurgent groups targeting police has been seen in many other internal conflicts elsewhere in the world. An article published in The Age newspaper (Ruby Hamad, ‘The devastating irony of calling UN troops “peacekeepers”’, 12 May 2016) detailed atrocities committed by members of UN peace and stabilisation missions and a systemic failure to address these atrocities. The article included a quote from Maya Goodfellow about UN peacekeepers: ‘… they’re applauded for bravely choosing to bring decency into a country where citizens are too barbaric to look after themselves. It’s this good vs. bad narrative that clears the way for violence’. The article, including quotes like this, suggests that the root of the problem was a simplistic view of UN police as ‘good guys’. It has been my experience from years of working in this field that the real cause of the problem is a much deeper misunderstanding of the role of police, and that of the military. What might generally be referred to and seen in action in Australia as liberal democratic policing is much rarer than most people understand it to be. Only a small percentage of the richest countries in the world have police that function in this way. Independent and impartial policing is considered a foundation of established rule of law and critical to a civil-led society. Across the rest of the world many ‘police’ do not perform the role we see here in Australia. ‘Policing’ in these countries can be carried out by the military or criminalised police who use their position to brutilise and oppress the civilian population for personal gain, through colonial policing that enables elites (whether political, social, economic, military, or criminal) to extract power and wealth from the population, to policing that looks much like Australia but gives overly preferential treatment to elites. A police uniform does not make a person a police officer. In some countries in the world a visitor or member of the local community would place themselves in more peril if they were to approach a ‘police officer’ for assistance after a crime. Policing is a values-based profession and no amount of training, provision of equipment, or appropriate remuneration will make someone a police officer if they start out with the wrong values base. The reverse is more often true – we train and equip them to become far more dangerous to the civil population than they were beforehand, a situation we have seen many times across the world. Nor does a military uniform make a police officer. The military has a role that is, and should remain, very different to that of police. An environment into which it is more appropriate to send soldiers to stabilise is no place for legitimate civil police as they, like any other mechanism of civil government, are nothing more than additional targets for enemy combatants. The military are deployed to these environments because their primary role is to engage enemy combatants and disrupt military or military-like (e.g., insurgency, warlordism, widespread internecine violence, etc.) operations to the point that civil mechanisms of government can again take back control and deliver effective civil governance. In the case of the UN, there simply are not enough liberal democratic police available to be deployed to post-conflict peace operations. As a result of this, the UN is put in the difficult position where it must often accept contributing ‘police’ from nations that do not uphold the values of the UN. Quite often these nations contribute what are frequently referred to as ‘Formed Police Units’ (FPU). FPU are made up of military or paramilitary personnel ‘rebranded’ as police. If lucky, a country receives contributing FPU members made up of ‘benign’ groups such as postal workers; in a worse case scenario they could be something far more dangerous. It is a mistake to think of the criminalised or militarised police I mentioned earlier as some sort of ‘rogue’ element in their country of origin; likewise, the FPUs that these same countries use domestically or deploy internationally. They perform the function their government expects of them and employs them to do. This is the reason complaints about their conduct go largely unaddressed. When deployed by the UN they will apply those same values to maintaining ‘order’ in the countries to which they are deployed. The root cause of observations about inappropriate UN peacekeeper behaviour is not that they are seen as ‘good guys’, but that they are seen as police when they are not. Nowhere is this contrast between the military and liberal democratic police seen more clearly than in situations like the one we recently saw in Turkey. One of the first acts by the leaders of the coup was to target police headquarters because the police are the legitimate civil mechanism for maintaining order. It is therefore in the interest of a military coup to remove independent and impartial police from the picture, thus leaving the military as the only mechanism capable of enforcing any sort of order. It speaks volumes to the desire for the rule of law in Turkey that the civil population rose up in response to this military threat to civil governance. In places like Afghanistan where police are targeted for the same reasons, civil society is unable to exert the same influence. Impartial police are the natural enemy of any group that wants to remove civil governance. Yesterday the Turnbull coalition announced plans to have the ADF, rather than Australian police, train paramilitary police in Iraq. Mr Turnbull was quoted as saying: ‘At the moment our training mandate is restricted to training the Iraqi army. And as we discussed, one of the most important objectives now in Iraq is to ensure that the Iraqi police forces, their gendarmerie forces, are able to maintain the peace in areas that have been liberated from Daesh or ISIL as the Iraqi security forces and counter-terrorism forces progress’ (David Wroe, ‘Australian troops to train Iraqi paramilitary police in expansion of role’, The Age 19 July 2016). The ADF are a supremely professional and capable military, and operate internationally with ethical standards equal to the best in the world. They have an excellent reputation for training members of the military from other countries. The ADF are not, however, police. What Mr Turbull is suggesting is that the ADF assist in the building and training of what by any other name would be called FPUs. To put our military in a situation like this is ill advised at best, dangerous at worst. Australia should not be involved in any way in the training of paramilitary police. If the situation in Iraq is seen to require the use of a paramilitary approach to policing, then the situation calls for a military response and not police. In these circumstances it is entirely appropriate to have ADF personnel train the Iraqi military, but it is not yet a situation for the wearer of any uniform that suggests that wearer is ‘police’. Australia, through the AFPs International Deployment Group, has contributed professional and impartial state and federal police to some of the most difficult and dangerous UN peacekeeping missions across the world. As one of the few countries that can contribute police of such a high standard we should ensure we exemplify the separation between policing and military that is such a critical foundation of the rule of law. IDG deployments are about reinforcing civil governance mechanisms. During one crisis in the Pacific region there was concern expressed by the Howard Government about media footage showing an ADF member, rather than a police officer, handcuffing someone. It is right for our Government to express such a concern when deployments are intended to substitute civil governance for military, not replace one military with another. Conversely it is very disturbing that our current government thinks this is acceptable given other views about security on the domestic front. Australia must contribute appropriate training in appropriate circumstances. This means ADF members training military staff, and Australian police training other police. This differentiation is non-negotiable. It is not enough to suggest the AFP will advise the ADF in this regard. To quote the character William Adama in the television series Battlestar Galactica: ‘There’s a reason you separate military and the police. One fights the enemies of the state, the other serves and protects the people. When the military becomes both, then the enemies of the state tend to become the people’. The writers hit the nail on the head. Wise words, best heeded by our Government and their advisors. ABSTRACT: Australian immigration detention has been identified as perpetuating ongoing human rights violations. Concern has been heightened by the assessment of clinicians involved and by the United Nations that this treatment may in fact constitute torture. We discuss the allegations of torture within immigration detention, and the reasons why healthcare providers have an ethical duty to report them. Finally, we will discuss the protective power of ratifying the Optional Protocol to the Convention against Torture and other Cruel, Inhuman or Degrading Treatment or Punishment as a means of providing transparency and ethical guidance. Howard Goldenberg, ‘The clinician and detention’. ABSTRACT: Australian immigration detention centres are in secluded locations, some on offshore islands, and are subject to extreme secrecy, comparable with ‘black sites’ elsewhere. There are parallels between healthcare professionals working in immigration detention centres and healthcare professionals involved with or complicit in torture. In both cases, healthcare professionals are conflicted between a duty of care to improve the health of patients and the interests of the government. While this duality of interests has been recognised previously, the full implications for healthcare professionals working in immigration detention have not been addressed. The Australian Government maintains that immigration detention is needed for security checks, but the average duration of immigration detention has increased from 10 weeks to 14 months, and detainees are not informed of the progress of their application for refugee status. Long-term immigration detention causes major mental health problems, is illegal in international law and arguably fulfils the recognised definition of torture. It is generally accepted that healthcare professionals should not participate in or condone torture. Australian healthcare professionals thus face a major ethical dilemma: patients in immigration detention have pressing mental and physical health needs, but providing healthcare might support or represent complicity in a practice that is unethical. Individual healthcare professionals need to decide whether or not to work in immigration detention centres. If they do so, they need to decide for how long and to what extent restrictive contracts and gagging laws will constrain them from advocating for closing detention centres. The compromised nature of healthcare has now been well documented along with the pervasive nature of dual agency (or dual loyalty) obligations, between that of patients, the immigration department and other contractors. This has only served to restrict and distort the nature of healthcare and limit clinicians in their roles with healthcare frequently subverted to other policy goals. Accountability is obscured and oversight is limited with arrangements that attempt to divest responsibility from the immigration department. At best clinicians are required to navigate ethically fraught terrain where they frequently have to compromise what may be ideal or even generally accepted treatment, at worst this promotes conduct that is clearly unethical. Along with the detention environment this all serves to curtail what benefits may usually be gained from treatment. These issues have played out in a more acute form in off-shore detention where there has been a number of examples of the immigration department intervening in medical transfers and treatment recommendations. 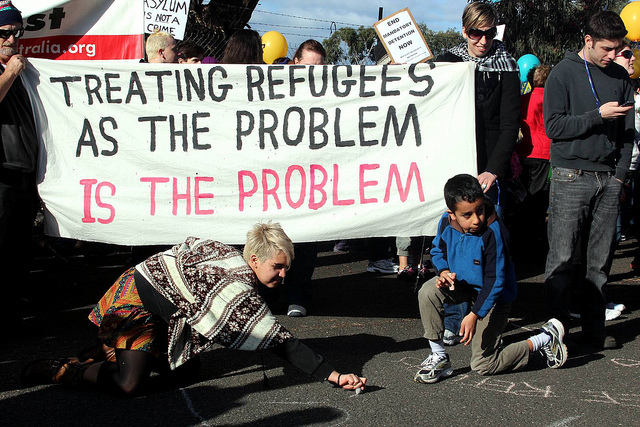 Sadly and justifiably, regardless of the final results of this past weekend’s federal election, those illegally detained in Australia’s offshore detention centres can expect nothing to change. We are being governed by xenophobic dragons with little regard either for the rule of law or for human decency. 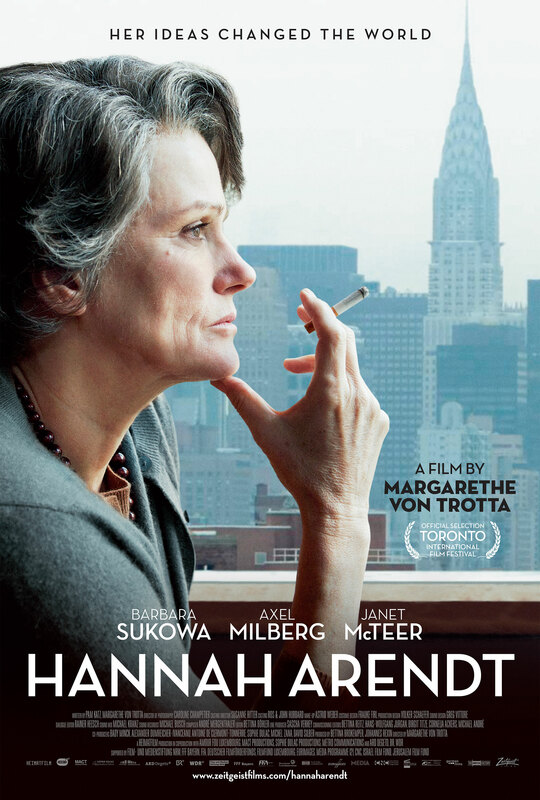 It’s been a while since I really looked forward to a film’s release, but I’m on the edge of my seat awaiting Margarethe von Trotta’s award-winning Hannah Arendt. The film’s focus is Arendt’s controversial reporting for the The New Yorker on the 1961 Adolf Eichmann trial, what Arendt named the ‘show trial’. Of course, one of the reasons for why this and other similar trials were so named by Arendt was because of her deep-seated conviction, expressed in a letter to her Doktorvater Karl Jaspers and published in Correspondence 1926-1969, that ‘the Nazi crimes … explode the limits of the law’. Indeed, ‘that is precisely what constitutes their monstrousness. For these crimes’, she continues, ‘no punishment is severe enough. It may well be essential to hang Göring, but it is totally inadequate. That is, this guilt, in contrast to all criminal guilt, oversteps and shatters any and all legal systems. That is the reason why the Nazis in Nuremberg are so smug … We are simply not equipped to deal, on a human, political level, with a guilt that is beyond crime’. As she would write in Eichmann in Jerusalem: ‘The purpose of a trial is to render justice, and nothing else; even the noblest of ulterior purposes — “the making of a record of the Hitler regime which would withstand the test of history” … — can only detract from the law’s main business: to weigh the charges brought against the accused, to render judgment, and to mete out due punishment’. I’m really interested to see how von Trotta deals with these difficult themes in the film. By the way, for those interested in reading an outstanding and critical (here meant in both senses of the word) engagement with these ideas may I commend to you Lawrence Douglas’ The Memory of Judgment: Making Law and History in the Trials of the Holocaust, a book that I shall probably re-read in preparation for seeing the film. HANNAH ARENDT is a portrait of the genius that shook the world with her discovery of “the banality of evil.” After she attends the Nazi Adolf Eichmann’s trial in Jerusalem, Arendt dares to write about the Holocaust in terms no one had ever heard before. Her work instantly provokes a scandal, and Arendt stands strong as she is attacked by friends and foes alike. But as the German-Jewish émigré struggles to suppress her own painful asso- ciations with the past, the film exposes her beguiling blend of arrogance and vulnerability – revealing a soul defined and derailed by exile. The film portrays Hannah Arendt (Barbara Sukowa) during the four years, (1961 to 1964), that she observes, writes, and endures the reception of her work on the trial of the Nazi war criminal, Adolf Eichmann. Watching Arendt as she attends the trial, staying by her side as she is both barraged by her critics and supported by a tight band of loyal friends, we experience the intensity of this powerful Jewish woman who fled Nazi Germany in 1933. The fierce, chainsmoking Arendt is happy and flourishing in America, but her penetrating vision makes her an outsider wherever she goes. additional reading, and further debate with her best American friend, Mary McCarthy (Janet McTeer) her German researcher and friend, Lotte Köhler (Julia Jentsch) and of course, constant consultation with Heinrich, she finally delivers her manuscript. The publication of the article in “The New Yorker” provokes an immediate scandal in the U.S., Israel, and soon in the rest of the world. HANNAH ARENDT provides an insight into to the profound importance of her ideas. But even more moving is the chance to understand the warm heart and icy brilliance of this complex and deeply compelling woman. So far, I’ve been unable to find out any details about when the film opens here in New Zealand (only that it seems that Curious is bringing it out here) and have had to try and satisfy myself with watching the promos and reading a few reviews, including this one published in Der Spiegel. If anyone has any details about when and where I can see it south of the Waitaki, then please let me know. ‘Western society has given itself the organization best suited to its purposes, based, I would say, on the letter of the law. The limits of human rights and righteousness are determined by a system of laws; such limits are very broad. People in the West have acquired considerable skill in using, interpreting and manipulating law, even though laws tend to be too complicated for an average person to understand without the help of an expert. Any conflict is solved according to the letter of the law and this is considered to be the supreme solution. If one is right from a legal point of view, nothing more is required, nobody may mention that one could still not be entirely right, and urge self-restraint, a willingness to renounce such legal rights, sacrifice and selfless risk: it would sound simply absurd. One almost never sees voluntary self-restraint. Everybody operates at the extreme limit of those legal frames. An oil company is legally blameless when it purchases an invention of a new type of energy in order to prevent its use. A food product manufacturer is legally blameless when he poisons his produce to make it last longer: after all, people are free not to buy it. And it will be simply impossible to stand through the trials of this threatening century with only the support of a legalistic structure’. 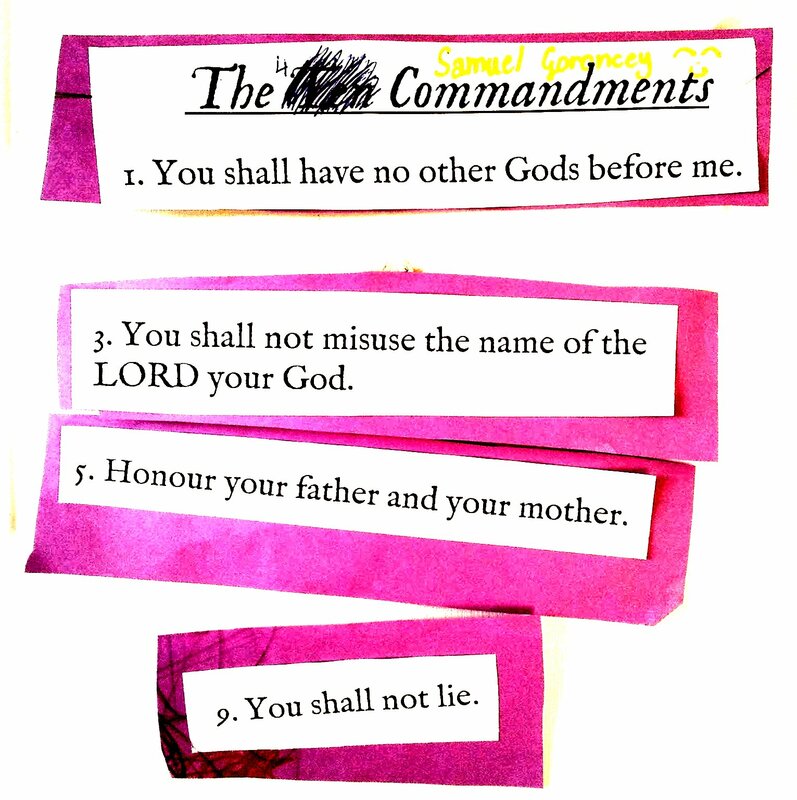 In every democratic and more-or-less secular country, similar questions arise about the precise extent to which religious sub-cultures should be allowed to live by their own rules and “laws”. One set of questions emerges when believers demand, and often get, an opt-out from the law of the land … What has upset the old equilibrium, say law pundits in several countries, is the emergence all over the world of Muslim minorities who, regardless of what they actually want, are suspected by the rest of society of preparing to establish a “state within a state” in which the writ of secular legislation hardly runs at all. The very word sharia … is now political dynamite. Full article here. And I have written more on this here. Also, NT Wright offers a helpful contribution to the post-lecture here in this Washington Post article.